This is my Healthy food heart with healthy food to unhealthy.We had to make a heart with the words Eat Most/Eat Some and Eat Least.We had to use,Fruit and Veggies/Breads and Grains/Meat and Alternatives.Milk and Milk Products and Fat's salt and Sugar.I was the first student to finish this work and I hope you like it. Hi jack i love your healthy heart. 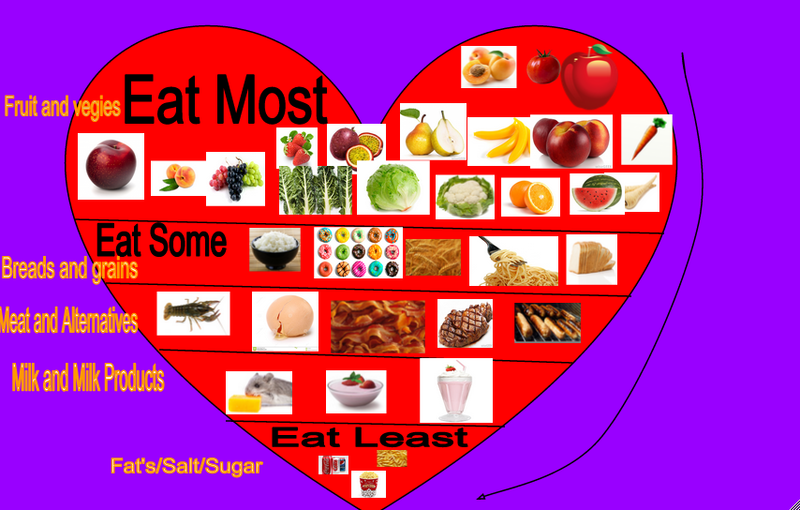 Hi Jack your Healthy Food Heart is suburb because it shows me what II need to be eating to have a healthy heart. I know that I can't eat junk food I need to eat veges and fruits and only eat meat sometimes. Hi Jack I really like your Healthy Food Heart. This tells me what kind of foods are healthy and what foods aren't healthy. Well done for thinking about your learning. 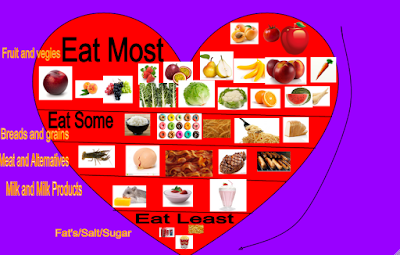 Hi Jack your Healthy Food Heart looks awesome because the Eat Most has the good things for your body and it is yum.I can see on Eat Least that these foods are not good for your body. I really like the way you put heaps of effort into your work. Hi jack your Healthy Food Heart looks fantastic now I know what to eat and now I know what not to eat. Hi Freeman.Thank you for looking and commenting on my healthy food heart.Maybe I will look at your healthy food heart and comment on it.I hope you do know what to eat and what you shouldn't.I also like your comment you have put on my blog,it is a lovely comment and it makes me happy.You can also look at my sentences to describe summer if you haven't,but if you have you can look at something else.